Sydney Chiropractors with chiropractic clinics in Crows Nest and North Sydney. Spine and Health Posture Chiropractors. A warm welcome from the Spine and Health team. We are Posture and Pain chiropractors and have been caring for patients since 2001. We fix your posture so you become pain free – and stay that way! Most therapies only focus on treating your symptoms, where as we focus on treating the cause. We look forward to meeting you at one of our clinics. 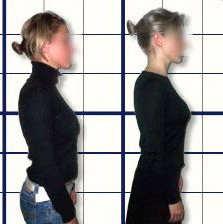 Posture is related to the positioning of your head. That is the degree of forward head carriage you have and the knock on effect that it has on your spine and surrounding muscles, which are trying to compensate and maintain your body’s centre of gravity. Several factors cause poor posture such as stress, falls, and car accidents but the biggest contributor in today’s society is the position in which we sit when using our computers. Back pain effects 8 in 10 people in Western countries at some point in their lives. 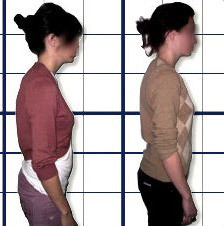 What most people don’t realize is the key to most back pain cases is poor posture. For every inch of forward head carriage one has the weight of the head doubles. This results in compensation by core muscles (posture muscles) and an increase in the load on the spine. With poor posture our bodies are vulnerable and normal daily movement can result in pain. Lifestyle choices can help reduce the likelihood of such complaints. Regular exercise, losing those few extra kilos we’ve gained over the years, improving work practices and concurrently reducing stress levels are all steps we have control over to improve our posture, well-being, pain (or susceptibility to pain). Neck pain can be treated with rest, gentle massage and the application of heat packs. If the pain persists the underlying issue is generally related to your posture and the next step should be to visit your chiropractor. Spine and Health’s aim to eliminate underlying problems by doing an anatomical analysis of your forward head carriage and overall posture. The neck is a delicate part of our bodies that is in constant use. It is made up of 7 small bones that are supported with, surrounded and attached by cartilage. We need to take care of our necks and we can do so by ensuring that we have correct posture. Imagine knowing you are about to get a migraine which can last for days to have it switched off in only a few minutes. Did you know that migraines are nerve pains? The nerve that causes migraines is called the trigeminal nerve, which is a nerve that supplies your face and structures in your head. This new migraine therapy works by calming down the activity of this trigeminal nerve, and therefore stops your migraines. When the therapy is applied during the onset of a migraine, the migraine is stopped dead in its tracks and does not develop. Somewhat sceptical? So were we! But we read the research, and the chiropractors of Spine and Health decided to get trained in this breakthrough technique. The results? We and our patients were shocked, as migraine after migraine, we were able to give relief and switch of the pain of migraine. It’s really clever research that addresses the major pain producing cause of migraines, which is over activation of the trigeminal nerve. The neurology is somewhat complicated but by gently stimulating the nerve to the surface of your ear drum it calms down the over activation of the trigeminal nerve which is causing the migraine pain. The ear drum nerve is stimulated by using gentle rhythmic air pressure (to the left or right ear or a combination of both, depending on the migraine presentation) to calm down the over active trigeminal nerve to switch off the migraine. 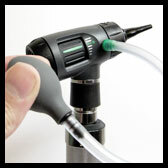 The device to deliver this gentle rhythmic air pressure is called an otoscope, and has a special attachment (an insufflation bulb) for this unique therapy. It’s gentle, non-invasive and free from drugs or manipulation. So if you or someone you care for suffers from migraines there is now a highly effective therapy for relief that requires no drugs, surgery, manipulation or home exercises. The best way to know if you can get migraine relief and stop suffering from this often debilitating condition is to come to one of our centres and receive a diagnostic consultation. If you fit the treatment criteria then treatment and relief from migraines can begin. Do you have some of the following symptoms? If so you could be suffering from migraines. Migraines are a multifactorial problem. Research shows that migraine sufferers have a dysfunction in their brainstem, which controls areas of pain control, balance, and blood flow regulation. Triggers for migraine can include foods, hormonal changes, emotional stress, fatigue, tight neck muscles, and trigger points and joints that are not functioning properly. Furthermore people who suffer from migraines tend to have a habituation problem. That is, the average person can walk in to a loud room and after a while will not notice the noise because the body adapts and blocks out excessive noise. Migraine sufferers do not have this response and so things like noise and stressful environments can cause a migraine to be triggered. The team at Spine and Health have found that the most effective way to reduce symptoms of headaches and migraines and also to reduce the likelihood of them being triggered is to restore normal posture. As we can reduce your amount of forward head carriage we reduce the stress this extra weight places on the body and also ensure the communication pathways from the brain to each part of the body are open and flowing. The terms “bulging”, “slipped” and “herniated” discs are all interchangeable. The spine has 24 moveable segments with 23 fibrous discs between them. These discs have a tough fibrous outer surface and a soft, gel-like centre, which enable a form of shock absorption. By standing we are placing weight-bearing forces on our spine and if we have poor posture the load is increased. A bulging disc occurs when a disc is out of its anatomical position and it is possible to be completely unaware of it. Alternatively if the bulging disc puts pressure on nerve roots we can have severe pain that radiates though the limbs, even causing paralysis of muscles and loss of bladder/bowel control. If a disc itself is ruptured it cannot ever fully repair but we can manage it by ensuring your correct posture minimizes the load it must carry. For every inch the head passes over the shoulders the effective weight of the head on the spine doubles. Depending on the scenario we can correct the positioning of the spine to encourage the disc back in to it’s anatomical position. Arthritis is a condition that causes pain, swelling, stiffness and inflammation in joints with the most common forms being Osteoarthritis and Rheumatoid arthritis. There is no cure for sufferers but there are treatments that Spine & Health can use to help relieve the symptoms and slow down the progress of the condition. Apart from direct trauma and genetic disposition, other causes for arthritis can be the lack of use of joints and poor posture. A joint is the meeting point of 2 bones that also involves ligaments, muscles, cartilage, a synovial capsule and of course the bones. A great way to prevent the onset of arthritis is to maintain movement of these components by leading an active life and having regular chiropractic treatments. The team of Chiropractors at the Spine and Health centres, located in Crows Nest and North Sydney are experts in aged care and particularly balance and falls concerns. Discomfort, pain and stiffness in the back can limit mobility. This will affect a person’s sense of well-being, increase the risk of depression, and decrease their quality of life. Lack of mobility will often result in and increased chance of falling in the elderly. Did you know…. for 65+ year olds 80% of all hospital admissions are from falls and falling is the leading cause of death by injury! Unfortunately 20-30% of people who fall will suffer moderate to severe injuries such as lacerations, hip fractures, or head traumas. These injuries can make it hard to get around or live independently, and increase the risk of early death. Your Chiropractor from The Spine and Health Centre can talk to you about ways to avoid falling and talk to you about the best therapy available to improve your balance. The best way to avoid falling is to eat well and keep healthy and keeping your spine healthy with good posture. Posture and Balance are actually related and as posture improves, balance and coordination also improves. Patient was falling over whilst playing lawn bowls, a game he was truly passionate about. Patient returned to playing Lawn Bowls without falling and then went back to playing Golf again! The joint of the body, particularly the spinal joints, give constant information to the brain about the bodies position in space. 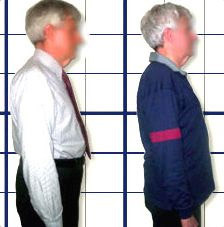 When you look at poor posture you are actually seeing mis- information from the joints to the brain. Left untreated the results in poor coordination and balance. To correct this problem the joints need to be gently manipulated to reset the information they send to the brain. The chiropractors Spine and Health are experts in diagnosing and treating poor balance issues.